Yuvraj Singh is an international Indian cricketer. He is widely and popularly acknowledged as a complete all rounder of the Indian cricket team. He is popularly nicknamed “Yuvi” by all his fans. Yuvraj Singh is an Indian Cricket player and has served as the Vice-Captain of the Indian Cricket team in the 2007 ODI matches. Nicknamed “Yuvi” in the cricket world, he exhibits slow left arm orthodox bowling and left-handed batting, making him an all-rounder. He idolizes Sir Garfield St Auburn Sobers, a cricketing genius, and became the only player after Garry Sobers to hit six 6s in an over. He hit 6 sixes in an over bowled by Stuart Broad during a Twenty-20 match against England in the 2007 World Twenty-20 Cricket tournament. 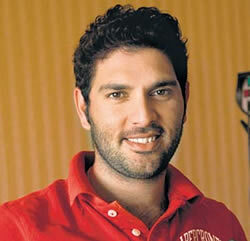 Yuvraj Singh was born on 12th December 1981, in Chandigarh. He is the son of Yograj Singh, a former Indian fast bowler turned Punjabi movie star, and Shabnam Singh, an actress. Yuvraj began his Cricket career at quite an early age, and was soon recognized as a rising star in the game. His impressive performance as the captain of the Under-19 Punjab cricket team earned him a spot in the U-19 2000 World Cup squad in Sri Lanka, during which Yuvraj Singh was named as the Player of the Series. Thus began an exciting journey in Yuvraj’s life. In 2000, Yuvraj made his ODI debut in a match against Kenya at Nairobi, which was a complete disappointment. It was in his second match against Australia, where he scored an impressive 84 off 82 balls, thus announcing his entry in the international cricket scene. In July 2002, he once again contributed to India’s win in the final match against England. Then in late 2003, he made his Test debut, and scored his first century in his second Test match, which was against Pakistan. Being a left handed batsman, Yuvraj often bowls as a Left Arm Orthodox Spinner; he is surely considered a far better batsman than a bowler. He has also shown his fielding skills by making a cumulative 21 run-outs in his 131 ODI matches, thus proving to be an all-rounder of the game. In his overall Test career, Yuvraj has played 28 Test matches, scored 1387 runs which included 3 centuries and 6 half-centuries, with an average of 35.56 runs and a highest score of 169 runs. He also managed to grab 7 wickets, gave away 316 runs with an average of 45.14 runs in these matches. As far as his ODI Cricket career is concerned, he has played 232 ODI matches and has scored 6850 runs including 11 centuries and 40 half-centuries. He averaged 37.43 runs with the highest score of 139 runs. In these matches, he took 72 wickets and gave away 2849 runs with an average of 39.56 runs. In 2011, Yuvraj was diagnosed with a cancerous tumor (stage-I) in his left lung and underwent chemotherapy treatment at the Cancer Research Institute in Boston as well as Medicine Facilities in Indianapolis. In March 2012, he was discharged from the hospital after completing the third and final cycle of chemotherapy and returned to India in April. He made his international comeback in a Twenty20 match in September against New Zealand shortly before the 2012 World Twenty20.